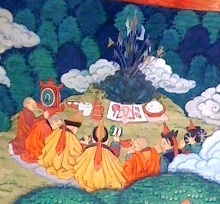 An Ovoo marks a sacred Mongolian landscape shown here in a special sacred thangka painting to encourage monks to protect the ovoos, and the landscape they are in. Mongolia is a traditionally Buddhist country. But during the communist period, from 1924 to 1989, Buddhism was suppressed in violent purges in which tens of thousands of Buddhist monks lost their lives and virtually all monasteries were destroyed. A few of the buildings were kept as museums and by 1989 there was just one working monastery in Ulaanbaatar – kept open with three monks in an attempt to show visitors from abroad that religion was not oppressed. Papers from meetings of the Mongolian Buddhists Parliamentary Group and from the Mongolian Nomadics and Buddhist Economics Conference, edited by Nambaryn Enkhbayar. read our 2004 update reporting activities in Mongolia. Nambaryn Enkhbayar, prime minister of Mongolia is ARC's first International President. Enkhbayar is a Buddhist who grew up as a communist – and he has drawn upon his faith to rebuild his country.